In 1941, Jim and his wife Elizabeth moved their family to Happy Valley-Goose Bay. With a decline in the fur trade industry, Jim found work building the Goose Air Base and continued to work as a carpenter once the base was constructed. Joe attended the first school in Happy Valley, completed high school and went on to postsecondary education. His varied career included working as a broadcaster with CBC, sitting in NL House of Assembly and working for the Department of National Defence. “I guess you could say I operated a ferry service here for one summer. We lived right out here on the bank, just behind where this house is now, and there was a canoe there. There was no road there, no Hamilton River Road, just here in town and it didn’t even have a name then. So if you came down from the base or you were going to base, you have to get across this creek out here and walk up Birch Island up as far as the boat club, it used to be called. Then there was a road down to the river from the base. That was about five kilometres or more. 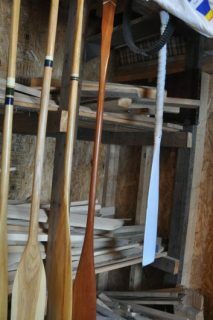 In the spring, migratory birds would arrive on Grand River (also known as Churchill River or Mishtashipu) before the ice had broken up, so hunters would paint their canoes white, dress in white, and put a white “fly” in front of them across the gunnels of the canoe to camouflage themselves. 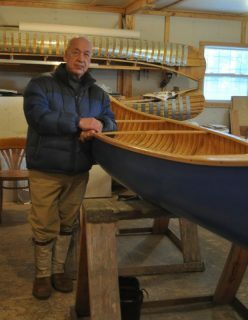 Joe learned how to build canoes in 1996 and started the Grand River Canoe Company the following year. “This was more of hobby for me than a business. It was a business, I made them commercially, and they were a custom build, but it was also a hobby.” After taking a break from building for almost three years, Joe returned to his craft in 2014. 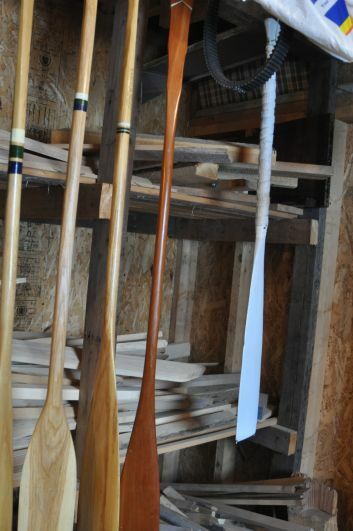 Read more about Joe Goudie’s canoes in our next post. We are so very proud of you Joe. In all that you have done for the Labrador region. So good to hear Joe’s voice again! When I worked for the IGA in 1968 and 1969, Joe invited me to do a ten week series of folk music on CFGB; “Hank Mixsell Sings.” I remember fondly the hours we spent in the studio and Joe’s gentle, friendly personality. 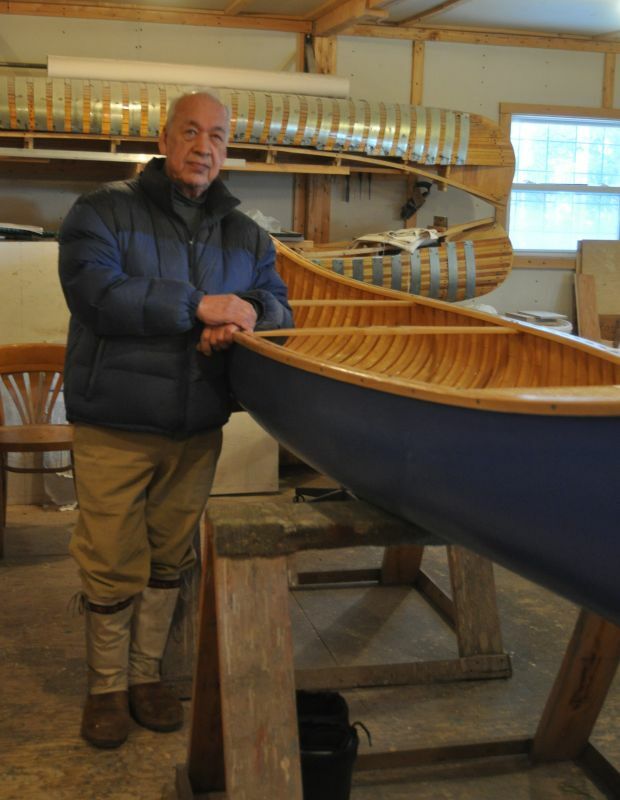 Although I knew he was a native Labradorian, I had no idea he was a master canoe builder! Please give him my very best regards. Those two years spent in North West River remain some of the best days of my life. In the mid 1960’s both Joe and I were single guys in Goose Bay and saw each other frequently. When the marriage bug struck me Joe sang at our wedding – a great baritone voice. On one occasion Joe and I flew to Cartwright in an RCMP aircraft, so he could interview a man by the name of Mickey Bird for a CBC program. At that time with CBC Goose Bay, there was a Saturday afternoon program called The Mokamee Mountaineers, with Gord and Unk. Joe was Unk and obviously he changed his radio voice to suit the new character. When he asked Mickey Bird for an interview, he was turned down due to apparent shyness. But when he found out that Joe was Unk, from his favourite radio program, Mickey was not short of words at that time – Joe got the interview he sought. I was transfered to various points in Newfoundland and Labrador in the ensuing years, but would give him a phone call on occasion, just to keep in touch. You will not meet a nicer man than Joe Goudie and I am happy to call him a friend.